This year, McNeel, publisher of the modeling software Rhinoceros, will organize its fourth resellers and partners meeting in Barcelona (Spain). As the developer of CrossCad/Plg, import and export plug-ins for Rhinoceros, Datakit will be attending this event and will showcase its products to the other partners. Datakit plugins for Rhino, for which the version 2014.3 has just been made available, make it possible to import files from a dozen of formats non natively supported by the software (ACIS, CATIA V4, V5 & V6, CGR, Inventor, JT, Parasolid, PLMXML, ProE / Creo Parametric, Solid Edge and UG NX). They also allow Rhino users to export their work to formats such as CATIA V4, CATIA V5, Parasolid and 3DPDF, in order to share their models with other CAD software users. 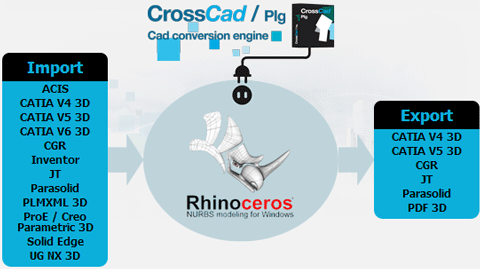 Two new export plug-ins have also been added to the last version: Rhino 3D to JT and Rhino 3D to CGR, bringing the number of exportable formats from Rhino to six. These plug-ins are available individually, depending on the desired formats, or as bundles including nearly all import or export formats available. Do not hesitate to contact Datakit if you also come to this event or if you want to learn more about CrossCad/Plg.